The youth vote is crucial in this election. Currently there are 2.4 million or so youth between the ages of 18-24. The oldest among this group turned 18 during Mahinda Rajapaksa’s first presidential term. This group witnessed the cruelty of the LTTE and the war that brought devastation to both sides. They also experienced the relief that came with the demise of Prabhakaran, the LTTE leader. During the 2010-2015 this group also learned to accept, by choice or otherwise, Mahinda Rajapaksa as the uncrowned but seemingly unassailable king of the country. They watched as the Government’s payroll swelled to 14 lakhs and even may have been a beneficiary. But, how do our youth really feel about the state of affairs in their country? 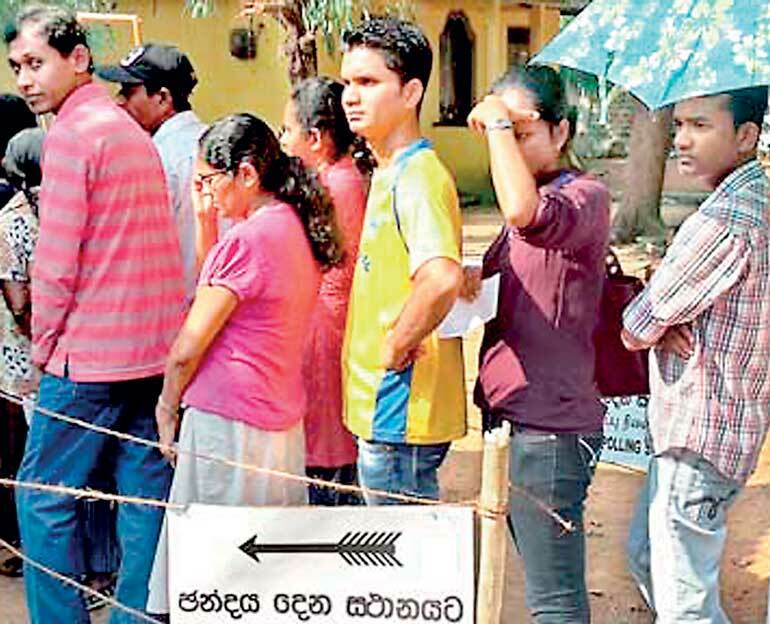 There is a widely held belief that this age group was instrumental in turning the tide against President Rajapaksa in the 2015 presidential election, but, we have little concrete evidence. Other countries such as UK, Australia and Malaysia carry out regular youth surveys but we don’t. We can get some indication of the lives of our youth through the quarterly labour force survey of Sri Lanka. The unemployment rate in Sri Lanka has remained at 4-6% in the last 10 years or so but, the unemployment rate for the 15-24 age group has remained high at 19-20%. Interestingly, the rate drops to 8-9% when this cohort reaches the 25-29 age group. One explanation could be that the 15-24 age period is a transition phase during which our youth wait for a job in government or in the formal sector, but settle for a job in the informal sector which accounts for60% of or more of the jobs in the country. These jobs in the informal sector are unattractive for many reasons including the lack of job security, lack of benefits, inability to secure loans, etc. The challenge for any government is to make the age 18-24 transition period more productive for our youth, increase the availability of jobs in the formal sector and make the jobs in the informal sector more attractive. Judging by their manifestos, all three major parties strive to do just that, but, in three totally different ways. The UPFA manifesto is divided into 12 components from national reconciliation, curbing corruption and economic growth to women and children and investments and infrastructure, but, each section is essentially a listing of give-aways such as low-interest loans, pensions or insurance schemes, duty-free vehicles and cash transfers, repeated for each sector. Even within a sector, certain groups are included and others excluded with no apparent policy rationale. Three wheel drivers are an especially lucky category who have been designated as receivers of not only of State-subsidised retirement and insurance schemes, but are also earmarked for duty free allowances for purchasing a car and low interest loan. Not to forget the youth, every young man or woman is assured of a low interest loan to purchase their first vehicle and youth from low income families are awarded 200,000 rupees per couple. The total package of these and other haphazard ‘gifts’ is estimated to cost 400 billion tax rupees to be pocketed out mostly by the same recipients.. The implication is that State should provide better jobs and also provide a plan within which the private sector would operate. Specifics of proposed State enterprises are listed elsewhere. Here there is heavy emphasis on the chemical industry for some reason, with a JVP government set to establish factories to produce super phosphate from Eppawela apatite deposits, calcium carbonate from chalk deposits of Balangoda to meet the demands of toothpaste makers, carbon products from graphite and sulphuric acid to meet the needs of various manufacturers and so on. What if our manufacturers find it they can be more competitive using imported sulphuric acid inputs, but an all-knowing State has already invested in a plant? The UNP is not shy about matching their political counterparts with goodies but these promises are made within a broad policy framework. Strategies for creating jobs in the formal sector include attracting large foreign direct investments such as automobile manufacturing plants, re-obtaining the GSP+ concessions, revoking the ban on fisheries products and furthering links to the regional economies through Free Trade Agreements. Insurance safety nets are offered selectively starting with farmers, fishermen, estate workers, garment workers and other in export processing industries. An unemployment insurance scheme is to be offered for all salaried employees in the first instance and extended to non-salaried workers or informal sector workers gradually. The choices are clear. May our youth choose wisely.